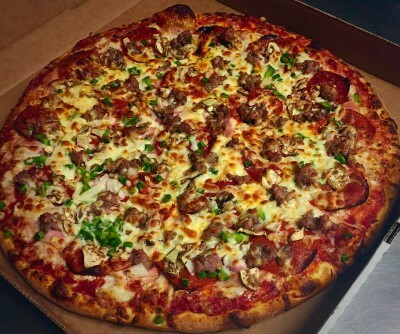 Hand Tossed 12" 14" 16" 18"
Pepperoni, Ham, Mushrooms, Onions, Green Peppers, Sausage, & Mozzarella. Tomatoes, Onions, Green & Black Olives, Green Peppers, Mushrooms, & Mozzarella. Alfredo Sauce, Chicken, Spinach, Tomatoes, & Mozzarella. Garlic & Herb Sauce, Ham, Mushrooms, Red Onions, Tomatoes, & Mozzarella. Pizza Sauce, Pepperoni, Ham, Italian Sausage, Bacon, Ground Beef, & Mozzarella. BBQ Sauce or Buffalo Sauce, Chicken, Red Onion, Bacon, & Mozzarella. Pizza Sauce, Ham, Pepperoni, Capicolla, Onions, Tomatoes, & Mozzarella. Pizza Sauce, Fresh Tomatoes, Sea Salt, Olive Oil, and Chiffon Basil. Pizza Sauce, Taco Meat, Tomatoes, Lettuce, Don Pauly's Taco Sauce, Black Olives, & Colby Cheese. 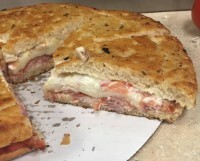 Mayo, Ham, Pepperoni, & Mozzarella. Mayo, Ham, Pepperoni, Red Onion, Tomatoes, & Mozzarella. Mayo, Ham, Pepperoni, Capicolla, Red Onion, Tomatoes, & Mozzarella. Pepperoni, Ham, Mushrooms, Onion, Green peppers, Italllian sausage, & Mozzarella. Homemade Alfredo sauce, Chicken, Spinach, Tomatoes, & Mozzarella. Homemade Garlic & Herb sauce, Mushroooms, Red Onions, Tomatoes, Artichokes, & Mozzarella. Pepperoni, Ham, Italian Sausage, Bacon, Ground Beef, & Mozzarella. Ham, Pepperoni, White Onions, Tomatoes, & Mozzarella. Breaded Chicken, Homemade Marinara Sauce, Fresh Basil, & Mozzarella. 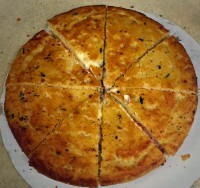 BBQ, Buffalo, Garlic, Parmeson, or plain served with a side of ranch. Tomatoes, Croutons, & Parmeson Cheese. Tomatoes, Red Onions, Mushrooms, Green Peppers, Green & Black Olives, Ham, Pepperoni, Capicolla, & Colby Cheese. 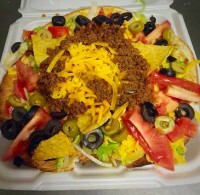 Tomatoes, Green & Black Olives, Onions, Taco Meat, Colby Cheese, Sour Cream, & Salsa on the side. Starts with Tomato, Red Onion, Cheddar Cheese, & Croutons, add Veggies for .50, Meat/ Extra Cheese. 12" Burrito shell stuffed with your choice of Meat/ Meat & Bean/ Bean/ or Chicken, topped with homemade burrito sauceand Colby Cheese, served with a side of fresh lettuce, tomatoes, salsa & sour cream. Charley's corned tortilla chips, layered with fresh colby cheese, homemade taco meat, white onions, and tomatoes. Served with a side of salsa & sourcream. Charley's Corned tortilla chips, layered with fresh colby cheese, served with a side of salsa & sour cream. ​Charley's corned tortilla chips serced with a side of salsa. 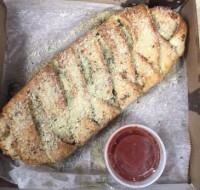 All Pasta's are served with a side of Garlic Bread. Your Choice of Meat/Cheese/ or Combonation, smothered in homemade Meat Sauce, topped with Mozzarella. Penne Pasta smothered in Alfredo Sauce. Your Choice of Meat/Cheese/ or Combination, smothered in homemade Meat Sauce, topped with Mozzarella. Layered with a Cheese Mixture, Smothered in homemeade Meat Sauce topped with Mozzarella. 6 Meatballs smothered in Homemade Meat Sauce. Ask the chef what he has on special today! Meatsauce, Italian Sausage Patty, & Mozzarella. Mayo, Turkey, Bacon, Colby, Mozzarella, Lettuce & Tomato.